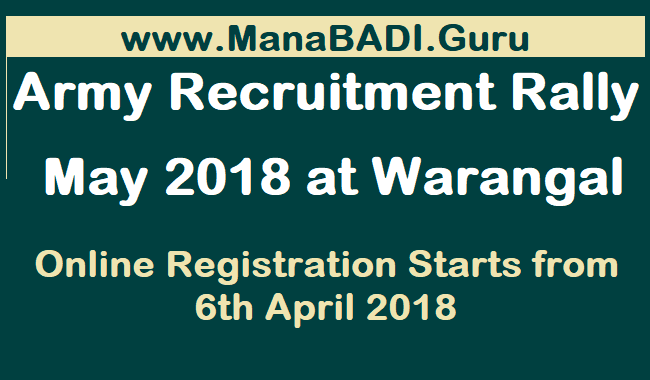 Telangana Army Recruitment Rally 2018, Army Recruitment Rally at Warangal, Indian Army Recruitment, Army Recruitment Rally Recruitmnet Warangal (Rural), Warangal (Urban), Adilabad, Bhadradri Kothagudem, Hyderabad, Jagtial, Jangaon, Jayashankar Bhoopalpally, Jogulamba Gadwal, Kamareddy, Karimnagar, Khammam, Komaram Bheem Asifabad, Mahabubnagar, Medak, Mahabubabad, Mancherial, Medchal, Nagarkurnool, Nalgonda, Nirmal, Nizamabad, Peddapalli, Rajanna Sircilla, Ranga Reddy, Sangareddy, Siddipet, Suryapet, Vikarabad, Wanaparthy, Warangal (Rural), Warangal (Urban) and Yadadri Bhuvanagir will be conducted at Jawahar Lal Nehru Stadium, Warangal Urban by Army Recruiting Office Secunderabad as under Warangal Army Recruitment Rally Recruitment May 2018. Army Recruiting Office, Secunderabad has released notification for Army Recruitment Rally From 21st May 2018 to 31st May 2018 at JAWAHAR LAL NEHRU STADIUM, WARANGAL URBAN (TELANGANA). All eligibl and Interested Candidates can apply online from 6th Aril 2018 to 5th May 2018. DON’T MISS THIS OPPORTUNITY TO JOIN A UNIQUE AND DIGNIFIED CAREER ARMY RECRUITMENT IS A FREE SERVICE. NO MONEY IS CHARGED. BEWARE OF TOUTS & HAVE FAITH IN YOUR CAPABILITY. Technical & Soldier Tradesman categories. Army Recruitment Rally under the aegis of Headquarters Recruiting Zone, Chennai will be conducted by Army Recruiting Office, Secunderabad from 21 May to 31 May 2018 at Jawahar Lal Nehru Stadium, Warangal Urban to enrol eligible candidates into the Army from all thirty one districts of Telangana State in Soldier Technical, Soldier Technical (Aviation & Ammunition Examiner), Soldier Nursing Assistant, Soldier General Duty, Soldier Clerk/ Store Keeper Technical & Soldier Tradesman categories. 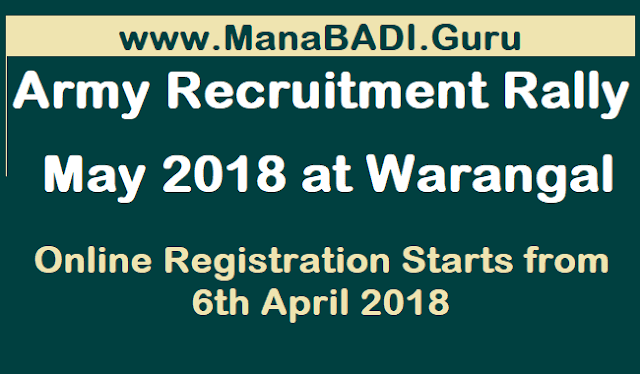 Candidates will have to apply online only as per 31 Districts of Telangana on the official website www.joinindianarmy.nic.in from 06th April 2018 to 05th May 2018. Admit card will be issued online after 09 May 2018. Candidates are requested to bring their admit card and application at the rally site. Date and time of reporting at rally site will be mentioned on the admit card. Print out of admit card can be taken after 09th May 2018 from www.joinindianarmy.nic.in. 1.Candidates with 10+2 Vocational Subjects are not eligible for Soldier Technical & Soldier Clerk/ Store Keeper Technical categories. They can apply for Soldier Tradesman/ Soldier General Duty if meeting required percentage of marks in Class 10th as per Para 4(d) and (e) of eligibility conditions. 3.Sportsmen who have represented India at International level and State at National level and even if they have not obtained 1st/2nd position are eligible for relaxation in physical standards and bonus marks in Common Entrance Examination (if passed subsequently) as per laid down policies on the subject. 4.Sportsmen who have represented their District at State level and University team or regional team at district level and have earned 1st/2nd position will be eligible for physical relaxation and bonus marks in Common Entrance Examination ( if passed subsequently) as per laid down policies on the subject. 5.For Clerk category, the entire question paper (all 50 questions) will be attempted on OMR Sheet and no separate subjective answer sheet will be used for English section. CANDIDATES WILL REPORT TO JAWAHARLAL NEHRU STADIUM, WARANGAL URBAN (TELANGANA) AT 0030 HRS ON THE SCHEDULED DATE AS PER THE PROGRAMME GIVEN IN THEIR ADMIT CARD. (No education relaxation for this category is existing presently). Educational Qualification:10+2/Intermediate pass in Science with Physics, Chemistry, Biology and English with 40% marks in compulsory subject and 50% marks in aggregate. OR B.Sc Degree (Botany/Zoology/Bio Science) and English (simple pass). Stipulation of marks laid down at 10+2 level will not be applicable for B.Sc. degree. However, the candidates should have studied all the four special subjects in class XIIth also. (ii) Stipulated marks percentage for 10th pass will be waived off for candidates having 10+2 and higher education qualification. (i) 8 th Class Pass. For House Keeper, Mess Keeper & Syce. (ii) 10th Class Pass. For Chef, Washerman, Dresser, Steward, Tailor, Artisan (Wood Work), Artisan (Metallurgy), Support Staff (ER), Artisan (Construction) and all other trades 10th simple pass/ ITI qualification in respective trades. Only candidates who have undertaken class X Board Exam would be considered. (a).Soldier Technical/ Soldier Technical (Aviation & Ammunition Examiner): 17 years 06 months to 23 years. (b).Soldier Nursing Assistant: 17 years 06 months to 23 years. (c).Soldier General Duty: 17 years 06 months to 21 years. (d).Soldier Clerk/ Soldier Store Keeper Technical:17 years 06 months to 23 years. (e).Soldier Tradesman: 17 years 06 months to 23 years. (a) The candidates should be medically fit to join Indian Army at the time of Rally. All candidates are required to register themselves online on the website www.joinindianarmy.nic.in and apply online wef 06 Apr 2018 to 05 May 2018. Kindly read instructions for registration and filling application forms on HQ Rtg Zone, Chennai web page of the join Indian army website. (a) SSC Mark Sheet (Class X). (b) Intermediate Mark Sheet (XII) and Certificate, where applicable. (c) Degree Mark Sheet and Certificate, where applicable. (d) Nativity, Community, Caste & Date of Birth Certificate. Candidates to produce latest automated Nativity, Community and Date of Birth Certificate issued by newly formed 31 Districts Administration of Telangana in English. Any cutting/ alteration will not be accepted. (e) Study and Conduct Certificate from last Educational Institute in English (Not more than six months old). (f) Character Certificate from Village Sarpanch/ Administrative Officer in English. (Not more than six months old). (g) Transfer certificate in original in ENGLISH. (h) NCC/Sports/ITI & Computer certificate (O++ level), if held. (j) In case of Non Matric Candidates, Transfer Certificate signed by Headmaster/ Principal of the school & countersigned by District Education Officer and Mark Sheet of last examination appeared, duly affixed with school seal and attested by Headmaster. Seal and language should be in English. (k) Twelve latest coloured 34mm x 45mm passport size photographs not taken earlier than six months with Name and Date of Birth printed on bottom of photographs of the candidates. The photograph should be without facial hair (Beard) and preferably with light coloured background and plain/ light coloured shirt. (i).All candidates will carry Aadhar card/ Aadhar Number for Aadhar Based Biometric Verification.